Combinez une croisière autour des chutes du Niagara avec un déjeuner buffet au Sheraton Fallsview lors de cette visite de 9 heures au départ de Toronto. Transport aller-retour depuis les hôtels de Toronto inclus. Préparez-vous à venir vous chercher à votre hôtel du centre-ville de Toronto vers 8 heures . ; Les hôtels situés autour de l’aéroport seront pris en charge vers 9 heures du matin. Montez dans un minibus confortable et partez pour Niagara Falls, à environ une heure et demie de route. En arrivant aux chutes, admirez une vue digne de photo de Table Rock et longez le bord. Montez à bord d'une croisière Hornblower Niagara (billet inclus) pour un aperçu de près; préparez-vous à être mouillé. 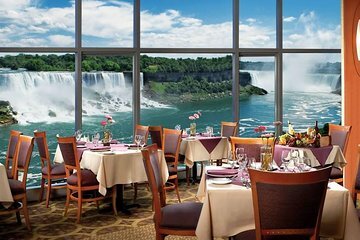 Après la croisière, dirigez-vous vers le Penthouse Sheraton Fallsview pour un déjeuner buffet avec vue sur les chutes Horseshoe. Passez du temps à explorer à votre guise avant de remonter dans l'autobus pour une promenade sur Niagara Parkway. Arrivez à Whirlpool Rapids, connu pour être la plus grande série d’ondes stationnaires en Amérique du Nord. Améliorez votre expérience avec un tour en hélicoptère pour des vues aériennes de ce phénomène. Continuez vers les centrales hydroélectriques voisines et les hauteurs de Queenston, où vous verrez le monument de Brock, la plus petite chapelle du monde, et l’horloge florale. Dégustez du vin de glace dans l’un des vignobles les plus réputés du Canada, puis visitez Niagara-on-the-Lake pour un temps libre. Retour à Toronto pour déposer à votre point de départ vers 18 heures. We happy for the tour guy is excellent,helpful ,come on time to pick up ,information for every place is clear ,we happy with this trip ,will happy book next time. I booked the tour because of all the features it included and because it was termed luxurious. I thought the tour vehicle would be a full-sized motor coach with all the amenities. It was an over sized van which rode like a truck. Our driver Fabio was very knowledgable, but spoke too fast to be understood with his thick accent. I only understood about two thirds of what he told us. I compliment him though on his driving skills which were severely tested in heavy Toronto commuter traffic. The Falls were magnificent, but crowded late August, which we expected. Would have preferred to spend a little more time walking around town rather than stopping off for so many photo opps on the way back. I recommend that Zoom keep the Reif Winery, Niagara-on-the-Lake, and the Floral Clock on the tour, and discard all the other stops. Our trip lasted 11 hours, which seemed too long. Leuke dagexcursie onder goede en ervaren begeleiding. De watervallen zijn zeker een bezoekje waard. Ook het bezoek aan het stadje Niagara-on-the lake was de moeite. Great day at Niagara Falls. We did the small group tour and really enjoyed the experience. Be prepared to get very wet at the falls but it is all part of the fun. Excellent tour, great guide who was very knowledgeable and obviously well known and well liked at the venues we visited. Niagara was amazing and the vineyard trip was interesting, although we would have liked to have sampled more than 3 wines. Niagara on the Lake was very beautiful. The guide's spoken English was very average and often difficult to understand. Coach comfortable and Niagara Falls was excellent. Having been in Canada for the last 3 weeks and having booked a number of tours through Viator and Expedia, this was probably the biggest let down. Having called up the day before to confirm my booking and hotel pick up, I was later that evening sent an email telling me the tour had been cancelled however I could be placed on an evening tour. Given we two of us were on a tight time schedule we agreed to the above. On the day, our luxurious mini bus turned up 35 minutes late. It was a hot day, initially the driver had hot air blowing through the bus and spent ages working out how to switch on the air conditioning system. Almost everyone on the bus was complaining at this point. The journey was average, certainly not luxurious as advertised. The commentary from the driver was poor, his English wasn't the best. He was difficult to understand. We had no clear idea where the driver was taking us. We was left second guessing everything as was the rest of the guest. The trip. Our first stop was 30 minutes at a wine tasting vinyard which my other half enjoyed and purchased a bottle of ice wine. The next stop was at Niagara by the lake. We were dropped of at a car park and told to return in an hours time. The driver pointed to a bus stop saying free shuttle into town. Had no idea how long the shuttle took or what was in the town. The town was about 5 minutes away, very picturesque. A number of people returned late because the shuttle bus service went from 4 buses to one, however to be fair to the driver he waited till everyone returned before taking us to Niagara Falls. We arrived just after 6pm. Went on the boat trip which was fantastic. You will get wet. The power of Niagara Falls was amazing. We then met in the Lobby at the Sheraton Hotel at 7pm. The views from the hotel was very good with a balcony allowing amazing pictures to be taken. The food a buffet was good. At 8pm we were taken to a stop where the water runs into the Falls. This would have been better to see during the daytime, before the boat tour however we spent an hour there. Personally I would have preferred to have spent more time at the previous stop as I didn't get to look at the Main Street which looks something like the Las Vegas Strip. A number of people on the bus had booked specially to see fireworks as advertised on Sunday. However were told during the tour there was no fireworks. I personally would like to have seen behind the Falls and selected the booking as it suggested this, the helicopter, and sky tower was an option, however there was not option for any. All in all, there were some good bits, however the trip certainly wasn't Luxury.